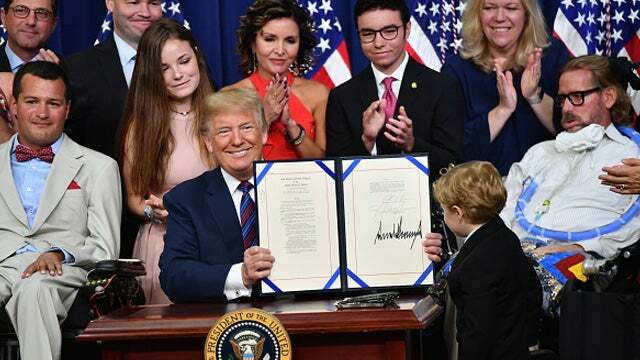 RUSH: As we speak, President Trump is on the verge of signing legislation that would give terminally ill patients the right to experiment with drugs, experimental drug treatments. And I think it’s the… The name of the act is actually called Right to Try. And believe me, this… You know, this is the kind of thing… It may appear to be insignificant to some people, but this is the kind of legislation that’s gonna just connect with people. You know the number of people who are diagnosed with terminal diseases who are willing to try anything — it’s their life — and all of the new things that are in experimental trials are just that. They’re in trials. They’re very difficult to get into, they are risky, and medical professionals try to talk you out of them. So people end up going to Mexico and Sweden, Switzerland, what have you. People have been willing to take these risks. And there’s been the concern about quackery in all of this, which is a legitimate concern. But this appears to be relatively tightly regulated. It’s the kind of thing that, once again, is going to just solidify the connection that Donald Trump has with people. This is something that the powers that be have routinely denied people who want to try this, and yet now it’s happening. Little things. They appear to be little things like this. And once people learn about them and associate them with Trump, he just keeps, as I say, solidifying the relationship or the bond that he has with his supporters. RUSH: Well, that’s a good point with this new legislation, the Right to Try bill, meaning if you have terminal disease and if you want to try experimental drug therapy, you can now. Contrast that with Obama. You remember this? ABC, the network of Roseanne… ABC ran a one-hour special from the White House. It was during Obama’s first term, on Obamacare. And Barack Obama did everything but wear the white lab coat. There were average citizens from the country in the White House where this TV show was broadcast. A woman stood up and said (summarized), “Mr. President, my mother is in her late nineties, and she loves living. The only thing wrong is her heart. She needs a pacemaker. Under Obamacare, would my mother’s will to live — would my mother’s desire to live, would her attitude — have any impact on whether or not your health panels agreed to pay for a pacemaker for her?” And Obama said, essentially, “No. “People at that age, that degree of illness, we would basically just give them a pill and make them comfortable.” I remember that I was appalled. I was aghast. I couldn’t believe, frankly, that it was even happening. Here we have an American citizen in the White House asking the president if his new health care plan will allow her mother to live! I… (stammering) What does the president have to say about that? Why in the world is he even in this equation, any president! But there Obama was, and he was lauding it all over these people. He was coming off as sensitive and heartfelt and compassionate. Oh, he cared. But he got very professorial. He put on the academic hat and started firing statistics at this woman, explaining that resources were not endless and by the time people that age reach that stage of illness, it probably would just make more sense to give them the pill and make them comfortable, that somebody’s will to live, that want to keep living? We can’t allow that to be a factor because that’s subjective, and these people these decisions have to be made clinically. It’s appalling, folks. And yet people in the room, some of them applauded just because it was Obama sounding smart. You know me. I have always… Ever since Barack Obama was declared brilliant and smart, I have thought we need to redefine “smart.” But for the left, smart doesn’t have to be smart. It just has to sound smart. It has to look smart. It has the proper intonations, the proper stuttering, the proper… uh… pregnant pauses for the right word. If you can game your speaking pattern to make yourself look brilliant, it doesn’t matter if you are. On the left, you can pass the test. It was appalling. But here now, contrast that with Donald Trump signing legislation giving terminally ill patients access to experimental drug treatment. I mean, you couldn’t get a more stark contrast and difference in the way average people are seen, looked at, viewed, treated, what have you.